Once in a blue moon we manage to coordinate things so that Kate and I have the same day off. Unfortunately this day off happened on Monday so our original plan to go to Samphire was ruined — they don’t open for lunch on Mondays. Instead we went down to the Barbican and into the Plymouth branch of Stable. 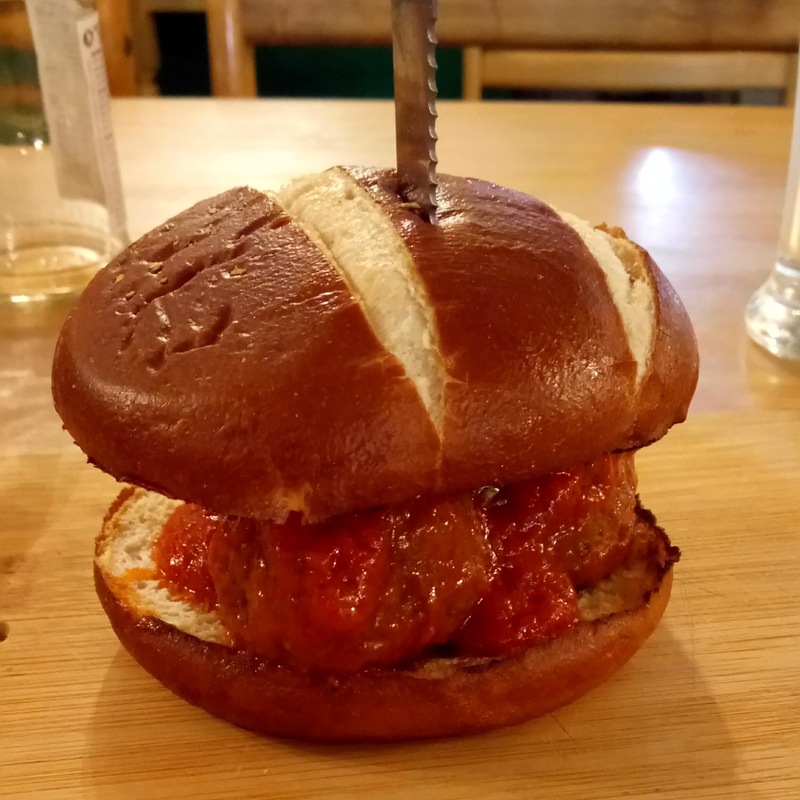 We reviewed the Exeter branch before but as they’ve changed up the menu, and as we managed to take better pictures I thought you wouldn’t mind me talking about them again. Kate likes plain things so she was happy that a plain, ordinary vegan margarita was on the menu. The cheese melts a little liquidy but they use a good amount and like every good margarita it comes with fresh basil leaves. I felt like veggies so I went for the Good Life. There’s courgette, peppers and onions which I love and aubergine which I love in theory but in practise the slices were a bit thick and tended to plummet off the pizza as I was about to get it in my mouth. Vegan cheese just doesn’t have the adhesive properties of its dairy counterpart. Structural problems aside it was a great pizza. You know we love Stable. So what it special about the Plymouth branch? Well the highlight is definitely the view and the gorgeous patio opens right onto the harbour. It’s also dog-friendly so perfect for every member of the family. Although Samphire kinda sounds like your average quiche and lentils 70’s vegetarian joint. Instead it’s pretty much the best vegan fast food place ever. I’ve snuck in here once before but all Kate got was a take away piece of cake. Time to visit together. After a warm welcome we were sat next to the record player. It was playing Sinatra and we would have changed it if we could only decide on the same music. Is being sat next to the record player the leading cause of divorce? Not with Samphire’s excellent menu to distract us. Samphire sell all sorts of awesome. Crepes, pizzas, buckets of chicken, and burgers. You know I can’t resist a good burger. I went for the Deep South. Two pieces of my new favourite fired chicken (with apologies to V-Rev. I still love you) a whole mountain of slaw, a slice of tomato and some of that lettuce that’s absolutely perfectly sized for a burger. There was some deconstruction involved before I could slap that top bun on and get the thing in my mouth. I removed the tomato, because I think it’s gross, and went the colourful veggie packed slaw. I only have three words to describe it. They are all nom. On the side of my giant burger I had some dirty fries. Technically they were ordered for us to share. Hosin Poison: fries with crispy duck, hosin sauce and spring onion on top. Unfortunately Kate decided she didn’t like hosin sauce so I had to eat them all by myself. I had to take a few of them home in a box but I’m proud to say that at the end of the day I’d ate the lot of them. Kate ordered the burger I had last time: Meatball Mania. Pretzel bun, meatballs, marinara sauce, pesto and a topping of their sharp cheddar. Other vegan meatballs go to sleep at night wishing they were these vegan meatballs. Perfect. We were so full from our feast that we didn’t need to eat dinner. Well except for the two whoopie pies we bought to go. Samphire is THE place to go for vegan fast food in South Devon. We really don’t go to Plymouth all that often. It’s usually once in two years rather than twice in one. My Mum came to visit recently and as we got to talking about breakfast places the Hidden Olive came up. We met up for a bit of Barbican fun with her and her partner. They ordered meaty breakfasts and admired the gin selection while I ordered my Big Vegan. A respectable offering. 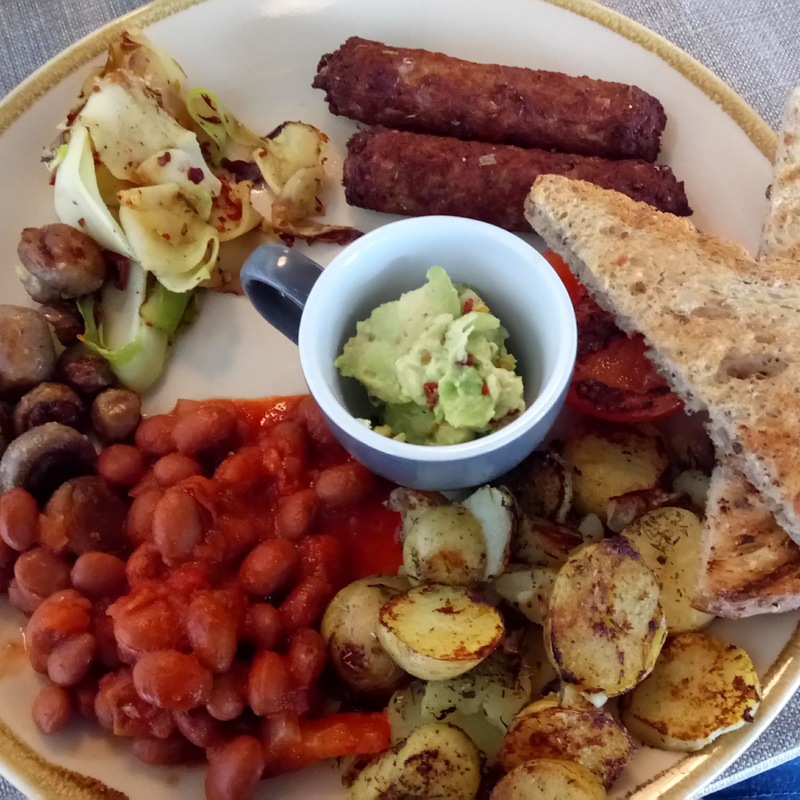 Two sausages, courgette ribbons, garlic mushrooms, fancy baked beans, potatoes and toast with avocado butter. The potatoes were especially delicious. After I said goodbye to Mum I popped in to Samphire for what was supposed to be a quick take away to get on the train with. Samphire is a 100% vegan fast food joint. I have no will power. I ended up eating in. So what did I order? Meatball Mania. Four of the meatiest meatballs I’ve ever had draped in tomato sauce with just the right amount of pesto and mozzarella. On a pretzel bun. My mouth is still watering. Ten out of ten. I’d eat here all the time but I don’t think I could’ve persuaded my Mum to try anything. As I finally got on the train home it was both with a full stomach and a full shopping bag. I popped into Ethica, Plymouth’s vegan shop, to buy some of the mock meats and cheeses that you can’t find in Torquay. 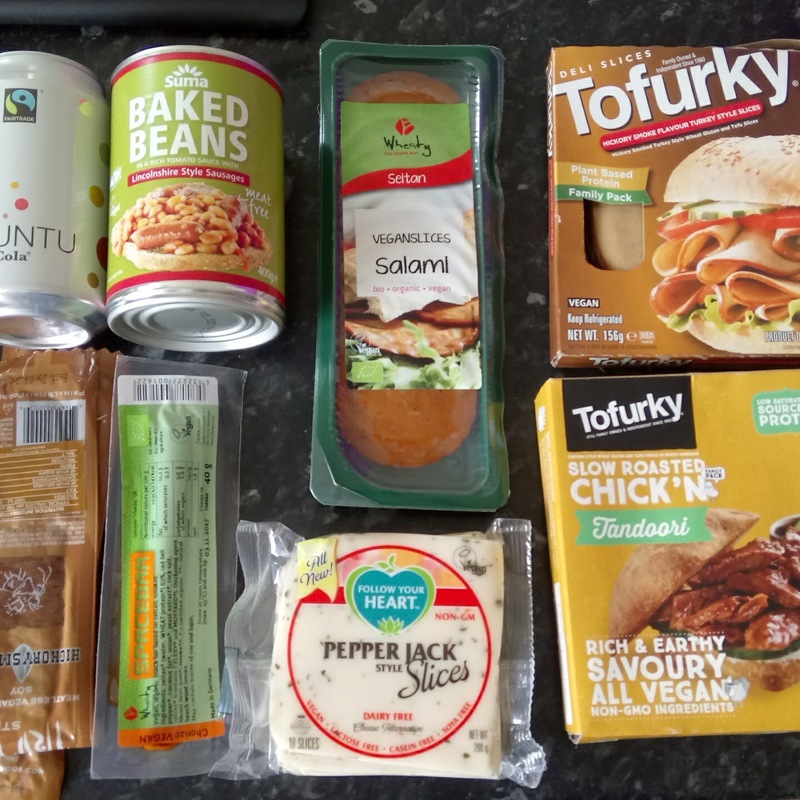 I’m aware that this post makes it look like I eat nothing but meat substitutes but you have to remember that this haul kept us going for at least… well it’s probably best not to say. I will say though that Ethica sells a fab range of staple and harder to find vegan foods along side cleaning products and toiletries. We may end up in Plymouth more often.